For her four cats, Roslyn has 3 traditional litter boxes and 1 automatic litter box. For my four cats, I have three traditional litter boxes and one automatic litter box, the Simply Clean®. The automatic box has made it so much easier to clean up after my cats. I get to spend less time scooping the litter boxes and more time playing with my cats. 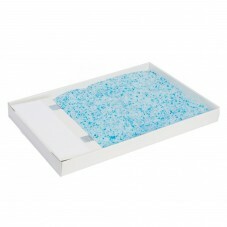 I want to share with fellow cat owners why I love my Simply Clean and why I think automatic litter boxes are amazing. 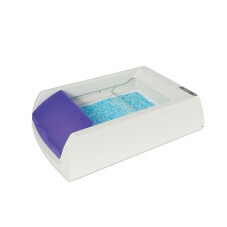 Constantly cleans The best part about automatic litter boxes is that they are always clean. Some automatic litter boxes rotate and sift out the waste, and some use a rake to pull the waste out of the litter. Then, the waste goes into a bin that you can dump out. Cats prefer clean boxes, so getting a box that’s always clean is the best way to prevent your cat from going outside the litter box. The Simply Clean bowl makes one rotation per hour and sifts the waste into a bin, so my cats’ waste isn’t sitting there for days. This is especially helpful in keeping my dog Doc from “investigating” the litter box and its contents. Other automatic boxes have manual or auto settings, so you can set it to run once a day or push a button every time your cat uses the box. Requires less scooping Automatic litter boxes do most of the scooping for you, so they save you time and let you scoop less. I estimate it takes me an hour or two each week to clean all of the traditional litter boxes and only a few minutes for the Simply Clean. With the Simply Clean, all I have to do is pull out the plastic bin, throw out the bag full of poop, and put in a new bag. Then I add some litter and do a quick scrape along the sides with a litter scoop to loosen any pieces that were stuck to the sides. If I replaced my traditional litter boxes with automatic ones, I would probably spend less than half an hour a week cleaning the boxes. Uses less litter Some automatic litter boxes are more efficient than standard litter boxes, so they use less litter. I have to throw out all of the old litter from the standard boxes once a month, but I only replace all of the litter in the Simply Clean every other month. With the traditional boxes, the waste sits there for a few days, so the litter absorbs everything. Automatic boxes separate the litter and waste quickly, so the litter doesn’t have a chance to clump up as much. 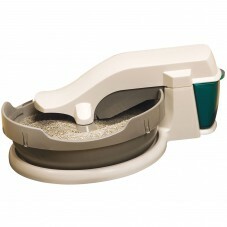 The Simply Clean Automatic Litter Box cleans your cat's waste for you so you can spend more time with your pet. No unpleasant smell Whether you get a hooded or open automatic litter box, they smell better than the regular litter boxes because your cat’s waste is removed quickly. If the waste goes into a bin, you can put some fresh litter in there to prevent bad smells. One reason cats prefer automatic boxes is that they smell better than traditional ones. Imagine going into a port-a-potty that hasn’t been cleaned in days. That’s what I imagine it’s like for cats to go into a dirty litter box. And when cats bury their waste, they don’t want to dig around in poop that’s been sitting there for days either. Cats adjust quickly Most cats love a clean box even if it’s new, but some cats are skittish around new noises or unexpected movement. The easiest way to get your cat used to automatic boxes is to unplug them at first, so they get into the habit of using them just like a regular litter box. Stop cleaning your standard box so they’ll only want to use the new, clean box. After a day or two, you can plug in the automatic box. Automatic litter boxes often have a safety setting so they don’t run when your cat is in it, but some boxes make a low humming noise when they’re on. My cats didn’t have any problem adjusting to the Simply Clean, and the soft hum when it’s plugged in is so quiet I can barely hear it with my ear right next to it. I love my Simply Clean and how much easier cleaning up after my cats is. I’m planning on getting three more automatic boxes so I won’t have to scoop the traditional litter boxes anymore. What kind of litter box does your cat use?